Hello! My name is Squirrels and I neglect my blog. I say I won't - but I do- again and again. It's just so easy to use Instagram to post a quick pic- and I'm just so swamped and overloaded that I don't have time to sit down and write a whole post. Okay, so I have been enjoying work free evenings. I've done a lot of crocheting. I've watched a few new series. 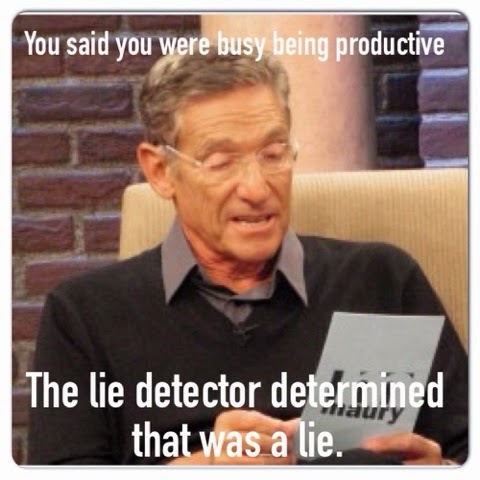 I've napped on the couch. I've stayed up all night stalking through 42 weeks of people's Instas. (Very careful not to like anything older than 2 weeks). So, I have "done" stuff if you're getting technical. I DID get productive with the NSLs (Not-So-Littles), for the MIL's Mother's Day and Birthday gifts- and that's the original reason for the post. Her bday is on the 12th of May and a few times it actually ends up being on Mother's Day. The MIL is a very unique and special woman- in the best way possible! Some of you have seen her 12 Days of Christmas that she does for us each year- or her other very inventive ideas. And since we know she is so creative and thoughtful when she celebrates a holiday with us, we want her to feel that we have put just as much thought into her! And she loves, appreciates, displays/uses everything that we send her!! 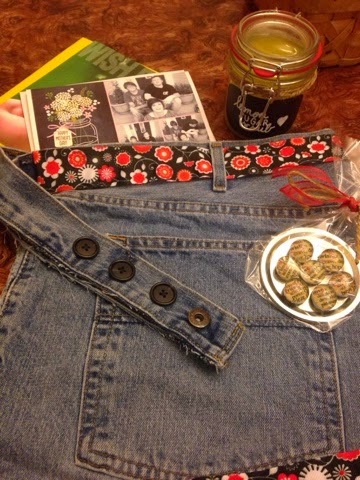 We picked three handmade items to make for her this year- that way each of the NSLs had something special to make. We scrolled through Pinterest and googled. And these are what we came up with. They were all pretty simple- but it was the fact that she would actually use them that made them stick out for us. 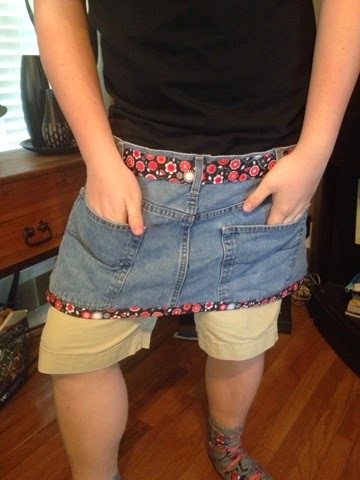 One of them was the gardening apron that is made from old jeans. She has lots of flower and fairy gardens, so we thought she could get lots of use from this one. We used a tutorial from YouTube. He picked out the buttons and ribbon - she loves red, black, and white! It was his first time to use a hot glue gun- he only burnt me once, so that's good. He even modeled it for me for this pic afterwards! I did add the buttons without his help. Sometimes the hot glue gun is a little uncomfortable for a bit - but needles will stab you and make you bleed. I thought better of having him attempt it. 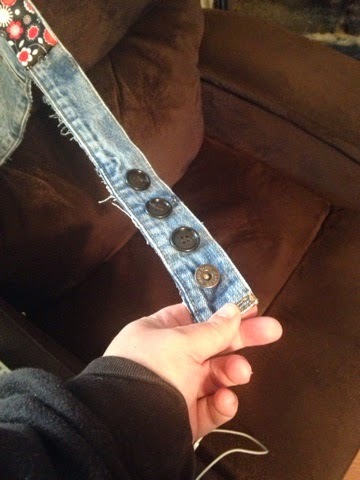 We added three buttons because these are The Mr. 's old jeans and I wasn't sure how she would need to adjust. The whole apron cost just under $5.00 to make! 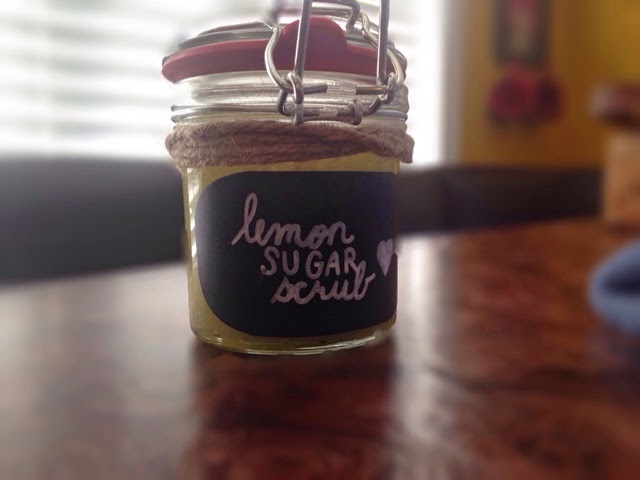 Chickadee chose to make the Lemon Sugar Scrub. I made it before with my firsties, so it was familiar. She used the simple olive oil, sugar, lemon juice recipe that we googled. We had the chalkboard contact paper and only had to buy the jar and the jute. ANOTHER present for under $5.00 that she will love and use. 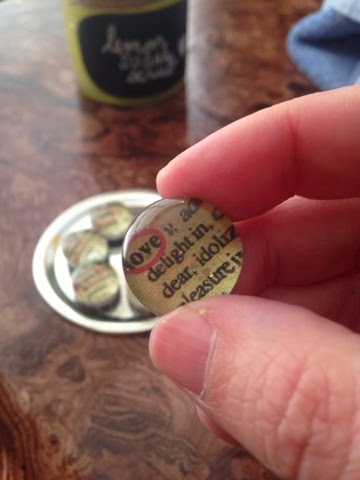 Littlest Not So Little made these adorable magnets for her. I have also made these in the past- not as a class- just because I saw it on the internet and I was probably supposed to be doing something else. They are very VERY simple. The circle dictionary entries were printed for free from scrapbook site a couple of years ago. I couldn't find these exact ones when I searched the web- I don't have that computer anymore. But there are tons available for free! We just used modge-podge to stick the circles to the bottom of these glass decoration pebbles. After they dried, he stuck the magnets on- they are even adhesive backed magnets- so no glue gun needed. 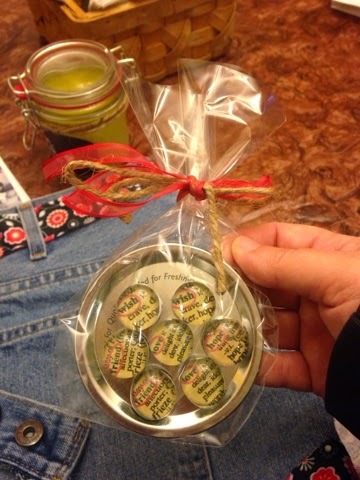 To put them together as a gift, he just put them on this mason jar lid, put in the bag, and tied with ribbon! Bingo Bango Dunzo! We had most of the materials here- just needed to pick up the magnets in a pack of 18 for $3.00! Now I know I listed about how much each gift cost to make- And yes, technically, we did make all of these for less than what it cost to ship it to her! She always says "Don't spend your money- just send me a picture!" I happen to know that she secretly adores DIY/CRAFTY gifts from the NSL- and I end up looking like MaGyver Mom because we racked up Grandma points with a paper clip and a roll of ribbon! HA! Maybe you have a last minute gift to make- we have a history of being last minute kind of people. I am very excited that we got this all made, packaged, and mailed off in ONE DAY! Easy Peasy- Lemon Scrub Squeezy! Thanks! I hope she does! I miss writing them, too- maybe I need to get The Mr to get me a new computer so that I have more inspiration!!!! The apron is adorable! You are such a good Mom! I love how you teach your kids such kindness. You are awesome, Missy Squirrels! !